Citrix Synergy 2016 landed in Las Vegas with a dynamic sense of purpose. The energy level of the show (the company’s annual industry conference, held May 24-26) was notably high, and the feeling of momentum wasn’t just limited to the Citrix team. It seems to me that Citrix’s new leadership team has markedly upshifted gears for both innovation and collaboration, and the company delivered a surge of news about key technology initiatives that promise to propel both Citrix and its partners forward. It’s not called Synergy for nothing. It was clear by the end of the keynote address by new CEO Kirill Tatarinov that Citrix is renewing its focus on innovation for its key technologies – and was intent on putting those innovations to work. Tatarinov also emphasized that Citrix was increasing integration with its longtime technology partners, and over the course of the show, attendees heard a lot about how Citrix and its major technology partners, including Intel, are collaborating on Citrix’s latest products. Figure 1. Bill Burley, corporate vice president and general manager of Workspace Services at Citrix, announcing Citrix support for Intel® Iris™ Pro graphics technology. To start off, Citrix announced integrated support for Intel® Iris™ Pro graphics technology across the full Citrix app and desktop virtualization platform, including the new release of Citrix XenServer* 7.0. 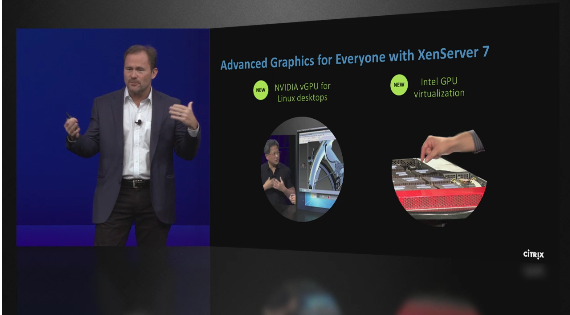 This means that with Iris Pro graphics technology running on the Intel® Xeon® E3 family platform, dozens of users can share a single graphical processing unit (GPU), offering a very low cost of entry for users seeking to take advantage of enhanced graphics and security on the Citrix platform. 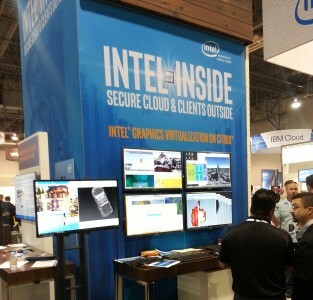 In our booth, we demoed Intel’s pre-production Skylake system, our codename for the Intel® Xeon® processor E3 v5 family, on the highly integrated, cartridge-based HP Moonshot System*. This platform offers the ability to host dozens of end-users in a variety of graphic modes, from single users-multiple apps (GT-S mode), to 3D graphical interfaces (GT-D mode), to group options that allow multiple users to share up to five different apps at a time (GT-G mode). The Intel-Moonshot platform is perfect for business users who need access to graphically intensive applications and workloads, but who don’t require a dedicated GPU-system per user. Figure 2. At the Intel booth, we demoed Intel graphics virtualization on the Citrix platform. 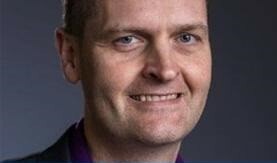 On May 25, Jim Blakley, general manager of visual cloud solutions at Intel, moderated the panel discussion Mobilize your Design Workforce: Delivering Graphical Applications on Both Private and Public Clouds. The group discussed how graphics virtualization technology can be used to deliver applications remotely, which applications are best suited for remote delivery, and best practices for a successful deployment. The entire session was recorded and is available here as an audio link. Jim was also interviewed on Citrix SynergyTV, where he provided a quick technical overview of Intel and Citrix collaboration in rich graphics virtualization. Citrix NetScaler* was also in the news at Synergy 2016. NetScaler is an application delivery controller (ADC), a software-based platform that manages network optimization, security, load balancing, analytics, orchestration and other network functions across a data center or in a cloud infrastructure. NetScaler is available in a number of deployment models, including pre-integrated appliances based on Intel processors that address a range of infrastructure and data center requirements. When deployed with the recently launched Intel® Xeon® processor E5 v4 family, the NetScaler appliances offer businesses superior network performance, data encryption, and system availability. For more information on how Citrix NetScaler and the Intel Xeon processor E5 family can help advance your software-defined data center, download this solution brief. Citrix Synergy also saw the launch of Citrix XenServer 7.0, the first server virtualization platform designed to take advantage of powerful hardware-based security and performance enhancements engineered into the Intel Xeon processor E5 v4 family. XenServer 7.0 unlocks Supervisor Mode Access Prevention (SMAP) capabilities in the new processors to provide an added layer of protection for virtualized workloads. SMAP works alongside other Intel security features, such as Intel® Trusted Execution Technology (Intel® TXT), to provide a hardware check against malware attacks aimed at hypervisor memory. XenServer 7.0 also takes advantage of Page Modification Logging (PML) capabilities that have been designed into the new Intel Xeon processor E5 v4. PML helps reduce runtime overhead created during typical live-migration processes by logging guest memory pages in the physical processor rather than in the hypervisor. CPU cycles that would have been used to track the memory pages are available for guest use instead. This reduces the load on the host, making VMs more responsive and boosting performance and overall utilization. PML and SMAP are examples of the kind of orchestration features included in Citrix XenServer 7.0 and enabled by Intel technologies; these are increasingly important in software-defined and cloud infrastructures, where redundant layers of management can limit efficiency, scalability and agility. Orchestration technologies allow users to enforce policies across a virtualized environment and deliver system-wide metrics to help improve application performance and infrastructure utilization. For more information about how Citrix XenServer 7.0 and the Intel Xeon Processor E5 v4 family can enhance data center security and performance, download this solution brief. It’s taken a lot of close and creative collaboration between Citrix and Intel to refine our joint software-defined approaches and virtualization technologies. But by working together, we can ensure that our co-developed technologies can help lead our customers forward. Follow me at @TimIntel and #TechTim for the latest news on Intel and Citrix.